Now is the time to re-energize your wellness program with fresh ideas and branded, health-positive incentives. Here are a few promotional products that will help any human resources department get employees interested in signing up. This sporty, six-panel mesh cap with accent piping offers serious sun protection for serious (and not-so-serious) athletes. This also makes a great giveaway at corporate outings and golf tournaments. Tones and strengthens the entire body. 3 bands (light, medium, and heavy resistance). Includes circular band, resistance tubing and figure 8 band. Foam-covered handles for comfort. 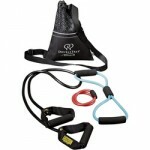 Includes 60 minute training DVD and portable drawstring storage bag with adjustable shoulder strap. Bands are made of durable TPR which are latex-free. Price includes custom decoration with your artwork. 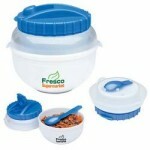 This item is perfect for encouraging employees to join your “Biggest Loser” competition. These unique socks make unforgettable event giveaways. Just add water and they’ll expand from pocket-size to full-size. Choose from a catalog of stock shapes, or create your own! Price includes full-color imprint on socks and full-color insert card. There are various stock shapes available, or we can customize it to match your logo. Small enough to fit in an envelope, this is a great way to announce your wellness program. Does your office have a gym or an early morning fitness class? Make it easier for employees to get there on time by helping them bring breakfast along. Interested in seeing samples of these items, or looking for help setting up your company wellness program? Give us a call!